As a non-denominational independent Christian church located in the southern suburbs of greater Detroit, Metro South Church caters to more than 1,500 people during their four Weekend Experiences. Recognizing the importance of delivering their message in a clear and appealing manner, church management recently elected to install a robust sound reinforcement system. After careful evaluation, the decision was made to deploy a new loudspeaker setup drawn from the Aero Series 2 catalog of Valencia, Spain-based D.A.S. Audio. GC Pro, the outside sales division of Guitar Center that focuses on the requirements of professional users, was contracted to design and install Metro South Church’s new sound system. GC Pro account manager Paul Johnson, working in conjunction with Guitar Center sales associate Paul Long and D.A.S. Audio regional sales manager Steve Trimble, oversaw the project. Ultimately, the new sound system included a sizeable contingent of D.A.S. Aero 12A powered two-way, mid-high line array modules along with LX-215A and LX-218CA sub bass enclosures. 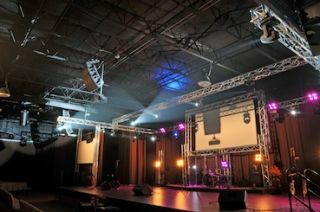 The house mains for Metro South Church’s new sound system consists of a left – center – right loudspeaker configuration. The system comprises fifteen D.A.S. Audio Aero 12A enclosures, with six elements each on the left and right hangs and a center fill cluster consisting of three modules. Low frequency support is provided by a combination of two D.A.S. LX-215A powered band-pass subwoofers and eight LX-218CA high performance powered subwoofers. “We stacked the subs on both sides of the stage, and this was done in a cardioid setup with some sub enclosures turned around in order to reduce standing bass on the stage,” Johnson said.